About time to meet Long Neck and does he wear the trousers? Little Miss wears the trousers, she's always on the go protecting their territory, Long Neck does his bit here and there. Swan relationships are not complicated, they have a strong bond and ultimately they both have a common aim, and that is to secure a territory and raise their young regardless of who does what. This photograph was taken on June 27th 2015 the day when Little Miss brought out her newly hatched Cygnets. 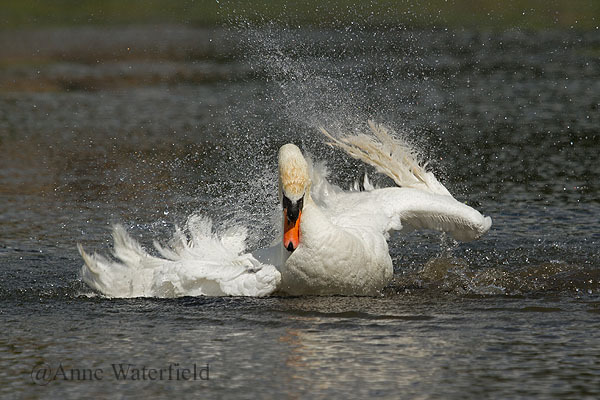 Long Neck was bathing like mad as he was going into moult and was very irritable, but when Little Miss came out with the Cygnets he was also showing delight by rising out of the water and making that call of pleasure.